Last year: I ranked Turner #28 and said he'd be a top backup cornerback. He redshirted. I was wrong about Turner last year. With Michigan's stunning lack of cornerback talent and depth, I assumed that their second highest rated recruit would be able to step in and at least get backup-level snaps. Unfortunately, Turner had problems passing his Ohio Graduation Test, showed up to fall camp late and out of shape, and couldn't grasp the defense quickly enough to play. 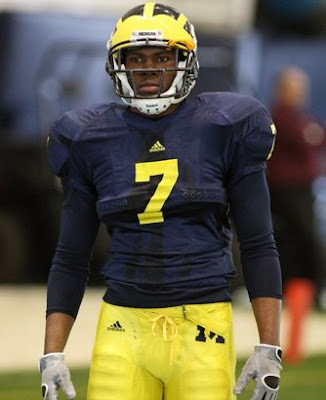 Meanwhile, Michigan's #2 cornerback Boubacar Cissoko was booted from the team and a 5'9" freshman who showed up on campus to play slot receiver (Teric Jones) ended the season as a second-string corner. Yikes. The word from this spring's practices was that Turner had outgrown the cornerback position, although this time it's muscle and not chub. He's apparently a big hitter and could be a solid corner in a Cover 2 defense where he sits in the flat and breaks on underneath routes, but playing man-to-man or covering a deep third isn't his cup of tea. A position switch to free safety or Bandit seems inevitable, but cornerback depth is still thin and the team might not be able to afford moving him just yet. It's going to be another wait-and-see season for Turner. Don't be surprised if incoming freshman Cullen Christian passes him up on the depth chart. If Christian can contribute this season, perhaps Turner can challenge Cameron Gordon, Jordan Kovacs, and Vladimir Emilien for playing time at one of the safety positions. Last year: I ranked Demens #47 and said he'd be the backup MIKE. He played sparingly on defense but contributed 7 special teams tackles. 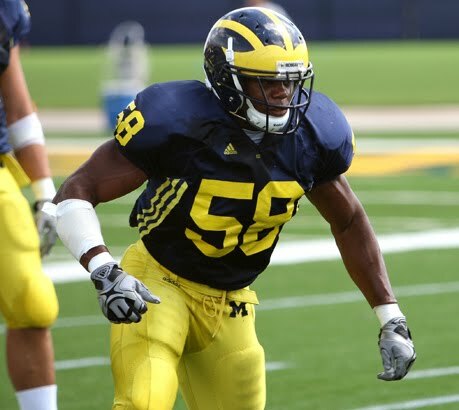 Demens has received a lot of hype in the run-up to the 2010 season, largely due to the fact that Michigan's inside linebackers - particularly Obi Ezeh and Jonas Mouton - have underachieved over the past two seasons and fans are looking for change. At 244 lbs. 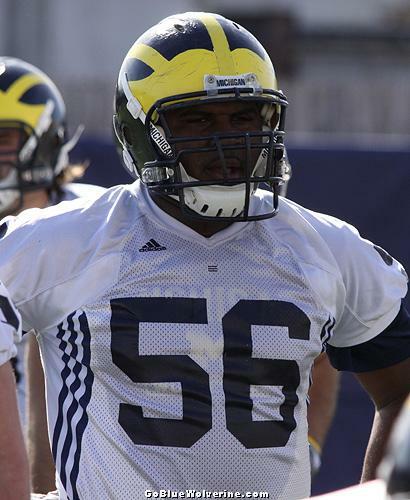 Demens is Michigan's heaviest true linebacker, despite also being the team's shortest at 6'1". That size has led practice observers to call him a "thumper" and a real threat to opposing running backs. I remain skeptical of Demens's level of contribution in 2010. He'll surely play, if only to prepare him for a larger role in 2011. But I think - and hope - that presumed starter Obi Ezeh will step up his play this fall as long as he's fully recovered from last year's back injury. Demens won't earn a starting job in 2010, but chances remain high that Demens is the heir apparent in the middle. He will, however, make an impact on special teams and be ready to step in adequately should any injuries occur. Last year: I ranked Smith #71 and said he's redshirt. He rushed the ball 48 times for 276 yards and 1 touchdown, as well as caught 10 passes for 82 yards and 2 touchdowns. Smith had a solid freshman season and contributed more than most people expected he would. The coaches made up their minds early that he would play, as he saw game action in the 2009 season opener. 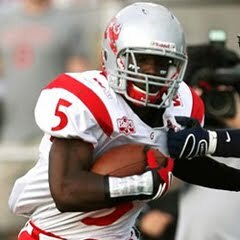 He had a great game against Delaware State, racking up 166 yards on 17 carries. Otherwise, he had a ho-hum season rushing the ball. Against FBS schools, Smith carried the ball 31 times for 110 yards, a 3.55 yards per carry average. He did, however, contributed a good deal in the passing game and scored Michigan's only touchdown against Ohio State on an 18-yard reception. Later in the game, though, Smith tore his ACL. 1. I don't know that I've ever seen a 5'6" starting running back at an FBS school, especially in the Big Ten. 2. Smith tore his ACL on November 21, 2009, meaning that he'll be less than 10 months removed from surgery when the season starts. Those injuries usually take 12 to 18 months from which to fully recover, especially for jitterbug running backs who will be bending that knee in all different directions. 3. For all of Smith's pass-catching ability, his running ability is lacking. His elusivity is his main strength, but his speed and strength leave something to be desired. It's not unusual for freshman running backs to adjust quickly to the college game, but 3.55 yards per carry indicates that the adjustment hasn't taken place yet. 4. There are better running backs on the roster, in my opinion. I do expect Smith to play in 2010. He has reportedly been running near full speed this summer (although not cutting quite yet), and being 20 years old certainly speeds the healing process. The coaches obviously like some of the skills he brings to the table. However, being the starting running back on a Big Ten team less than 10 months removed from a torn ACL isn't likely. Although I don't expect it, I'd like to see Smith take a medical redshirt in 2010 and recover completely in time for the 2011 season. Last year: I ranked Webb #40 and said, "If Webb catches more than five passes all year, I'll be surprised." He caught 4 passes for 44 yards and 1 touchdown, including a 28-yard TD against Delaware State. Webb is a solid blocker and a decent athlete. 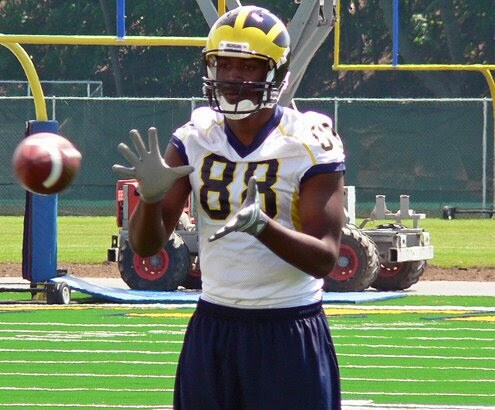 If the Lloyd Carr regime were still running things, I'd guess Webb would catch 15-20 balls this year. But the tight end position has been de-emphasized with Rich Rodriguez, and the combo of Webb and Kevin Koger only caught 20 passes total in 2009. This does not bode well for Webb's farewell season. This year I would not be surprised to see a slight uptick in passes thrown to tight ends, partly because starter Koger is a junior and Webb is a senior. Another part is that Michigan's outside receiver depth is quite thin, and that might force slot guys like Martavious Odoms and Roy Roundtree to play out wide more often. With slot guys moving wider, we might see Koger and Webb playing in the slot more often. The final part of that equation is that the quarterback duo of Denard Robinson and Tate Forcier now have a year under their belts and should start looking to use the middle of the field more often. This will be Webb's best season at Michigan, but it probably won't be what he expected when he committed to Lloyd Carr. Last year: I ranked Sagesse #34. He made 8 tackles and 2 tackles for loss. Sagesse is one of those guys that you feel for a little bit. He's a big guy and a solid talent. He could probably be a starter and the defense and the defense wouldn't miss a beat, but he's not a star player. He's been essentially the same player now for three years, and while I don't expect a giant leap forward from him in 2010, I do expect him to continue his consistency. He offers some versatily in that he can play nose tackle and defensive tackle. In fact, he played 3 games at NT and 6 games at DT last season. But Michigan didn't lose anyone from the interior defensive line, and Sagesse remains a backup. Fellow lineman William Campbell was more highly touted, but also lacks consistency. Both will get plenty of time on the line, but right now, I believe Sagesse to be the more solid player. Sagesse's final season should be virtually a mirror image of his junior year - maintaining his gap, making a smattering of tackles, and being a good glue player for the Wolverines. Last year: I ranked Williams #17 and said "Big hitter needs to solidify safety spot." He did not, although he recorded 56 tackles. By the end of last year, a lot of people had given up on Mike Williams. He came in as a pretty big-time recruit after playing in the Army All American Game but redshirted as a freshman, partly due to injury. With the regime change that came prior to the 2008 season, Williams was kind of thrown under the bus - not on purpose, but by circumstance. Under Lloyd Carr and Ron English, Williams was being groomed to play the slot corner position that Brandon Harrison played so effectively. That position was essentially eliminated with the hiring of new defensive coordinator Scott Shafer, and Williams moved to safety. That's where he remained in 2009 with the hiring of Greg Robinson, but Ron English had a bead on Williams (whom English recruited out of California) that the two subsequent coordinators have not. English could see that Williams wasn't great playing in space, which is why he intended to play Williams over the slot. 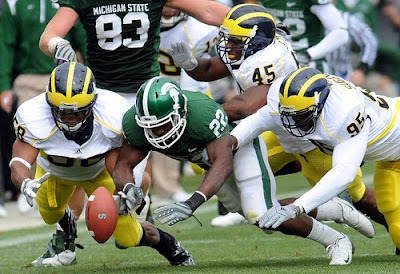 Due to shoddy recruiting, injuries, and what MGoBlog has deemed "Angry Michigan Safety Hating God," Williams found himself covering deep zones in 2009. If you're wondering how that worked out, check out the 2009 Michigan-Iowa game. Yeah . . . not good. In addition, Williams was prevented from playing special teams in 2009, a unit on which Williams blocked a punt and made 11 special teams tackles in the previous year. For spring 2010 Williams moved to Spur, which is essentially the position Steve Brown occupied in 2009; it's a linebacker/safety hybrid, one that won't have deep responsibilities very often (if at all) and will largely be supporting the run. This fits Williams's strengths well. He dropped to third on the depth chart in the spring (behind Thomas Gordon and Floyd Simmons), but the story's not over for Williams. He'll face stiff competition from incoming freshmen as well, but Williams has this year and 2011 to make his mark. If he can become more disciplined (Illinois quarterback Juice Williams embarrassed #40 several times last year), he has the speed and hitting ability to be a good player. If nothing else, he should be flying downfield on coverage units. Last year: I ranked Moundros #23 and said he'd be the starting fullback. He assisted on 1 special teams tackle and played sparingly at fullback. Moundros is an interesting - okay, confusing - case. 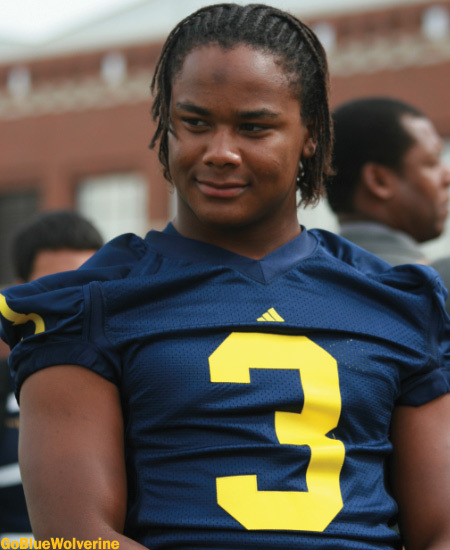 He had over 2,000 yards rushing as a senior in high school, then walked on to the Michigan football team. He beat out a couple scholarship fullbacks for the starting job, forcing them to switch positions and subsequently leave the school. 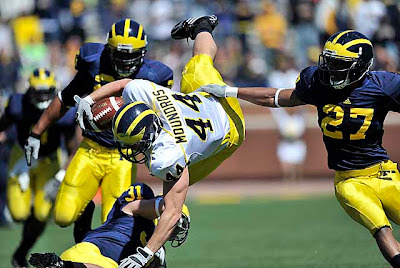 He was named Michigan's Special Teams Player of the Year in 2008, caught a touchdown pass, ran the ball effectively in limited opportunities. He seemed to be the up-and-coming Owen Schmitt of the Wolverines. Then in 2009 . . . nothing. He got a concussion early in the season on kickoff coverage, but still played in all 12 games. He barely played at fullback, despite looking fast and athletic in the 2009 spring game. 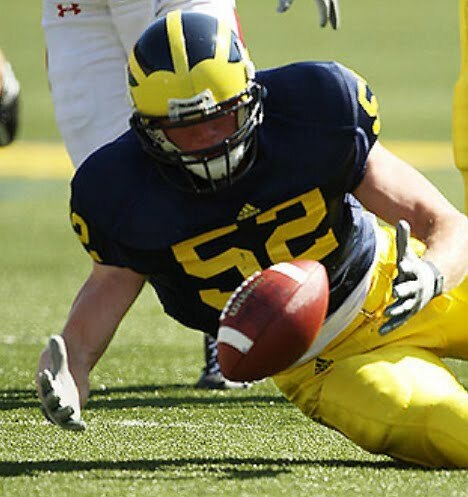 After all the hype surrounding Schmitt at WVU, Michigan's lone fullback specialist was a ghost. Maybe the coaches thought Kevin Grady was a better fullback and deserved to play in his fifth year, despite being a tailback/fullback hybrid-type. Grady did contribute 80 yards on the ground, but 73 of those came against Delaware State. This past spring Moundros asked to get some reps at inside linebacker, just for a chance to see the field and help the team. He was given the opportunity and will supposedly continue to get reps at MLB, but I don't expect to see him on the field there this fall. His 2009 disappearing act notwithstanding, I do expect Moundros to be the starting fullback in 2010. 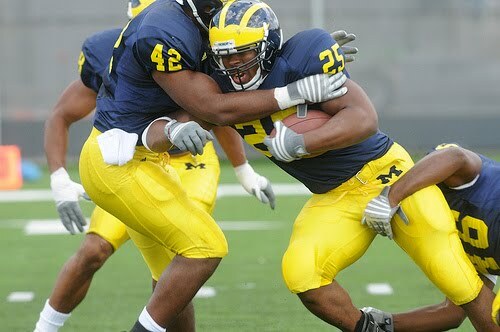 He's a good blocker, has soft hands, and is more athletic than any Michigan fullback since BJ Askew. I don't expect him to approach Schmitt's statistics (47 carries, 272 yards, 5.8 ypc, 4 TDs as a senior at WVU), not only because Schmitt was a superior athlete, but because freshman Stephen Hopkins might steal some of those short yardage carries. But he could be a very solid contributor in 2010, and if nothing else, he should make some crushing blocks. Last year: Simmons was unranked. He contributed 5 tackles, 1 forced fumble, and 1 tackle for loss from the SAM linebacker position. Simmons is pretty high up on this list for being a walk-on. He started off as a practice squad cornerback in 2008. Last season he moved to SAM and backed up Steve Brown, posting 5 tackles. This season he'll be playing Spur, which is a hybrid strong safety/linebacker. Three different positions in three different years. Spring practices went well for Simmons, and there was a time that he was considered the frontrunner for the Spur job. By the end of spring, it seemed he was beaten out by Thomas Gordon. Regardless, Simmons is vying for playing time this year. He'll be challenged by a freshman or two (Carvin Johnson, Josh Furman), but he has the advantage of spending a couple years with the coaches, knowing what they expect, and working with them in the weight room. He's not a star in the making, but he's been solid wherever these coaches have deployed him. Flash forward: I will be on the receiving end of this football thrown by Jessica Alba. I will be on vacation from this Saturday to next Saturday, and my internet availability will likely be around zero. However, I'm working to finish enough 2010 Season Countdown posts to run for the remainder of next week, and hopefully one will be posted each day that I'm gone. Other than Countdown posts, content will be sparse or non-existent. If Michigan receives any commitments in the next week (which is a possibility), I'll have to catch up when I return. Last year: I ranked Stokes #45 and said he'd see limited playing time. He played in 6 games, catching 2 passes for 16 yards against Delaware State. 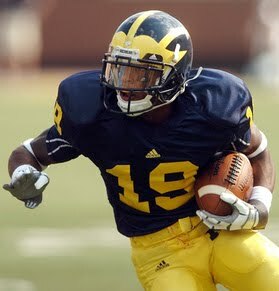 Stokes was a highly rated recruit coming out of Philadelphia in 2009, going on a somewhat meandering journey before signing with the Wolverines in February. He made two catches as a freshman and spent the last five weeks on the sideline due to injury. 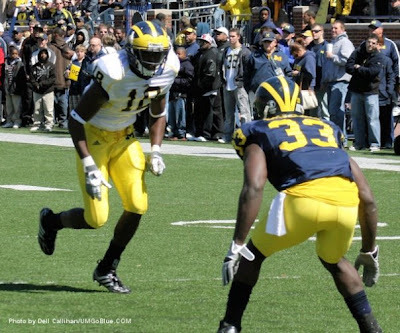 While wasting a redshirt year to make two catches might seem like a shame, it's important to keep in mind that Michigan lost a couple seniors after the 2009 season (Greg Mathews, LaTerryal Savoy) and Stokes will be forced to play in 2010. It was important for Stokes to get some reps against college-level competition in game situations, because other than presumed starters Darryl Stonum and Junior Hemingway on the outside, Stokes is all that stands between trotting out a freshman or three. Slot receivers Roy Roundtree and Martavious Odoms will also probably see time on the outside, but Stokes will need to spell some of the more experienced receivers. He has been compared to Mario Manningham as a receiver, and while Stokes hasn't shown the knack for catching the deep ball that Manningham had, Stokes has shown the ability to work his way open and find windows when the quarterback scrambles. That's a helpful trait, since Michigan's quarterback's are both about six feet tall and run frequently. Last year: I ranked Herron #25, assuming he'd beat out freshman Craig Roh for the OLB position. Herron was Roh's backup, making 20 tackles, 1 tackle for loss, and 1 fumble recovery. 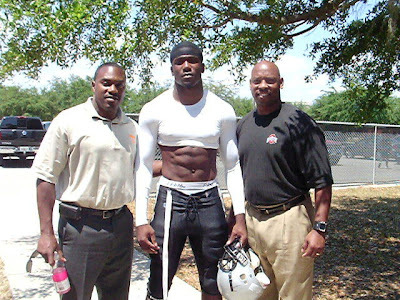 Reports from spring 2009 indicated that Herron was a physical freak with great speed and strength for his relatively small size for a rush linebacker. Having two years of experience on Roh, Herron was the expected starter. However, Roh beat out the then-redshirt sophomore and held onto the position. Herron played occasionally, but got pushed around in the run game. Now it's 2010, and Herron's spot as the primary backup at OLB has been relinquished to J.B. Fitzgerald. Spring practice ended without much of a peep from Herron, who's still only 220 lbs. I'm not sure if the coaches have mandated that Herron maintain that weight, but it seems odd that he wouldn't bulk up more to defend the run. Sometimes injuries or illness prevent guys from adding weight, but I haven't heard anything to indicate such a problem for him. While Roh added approximately 15 lbs. and weighs over 250 now, Herron remains somewhat of a lightweight. He could contribute on special teams and is an adequate backup at OLB, but I would not be surprised to see Herron's redshirt junior year be his final season at Michigan. Last year: I ranked Lalota #73, said he'd redshirt, and predicted he'd play defensive end (he also got reps at OLB in spring 2009). He redshirted and moved to defensive end. It's good to see that Lalota is back up to the weight that he supposedly was in high school. As a high school senior, he was listed as a 6'6", 260 lbs. prospect. When he got to Michigan, the roster said he was 6'4", 235. Now he's apparently gained those 28 pounds back, which he'll need if he's going to play strongside defensive end this year. Brandon Graham graduated, and Ryan Van Bergen has moved from defensive tackle to defensive end. Lalota should be his primary backup, especially now that Will Heininger will miss the season due to a torn ACL. Coming out of high school, Lalota was a project, having only played football during his junior and senior years. Getting a significant contribution from him this season will be a huge positive. However, I think Bruce Tall will rotate players in an effort to get his upperclassmen on the field rather than throwing Lalota out there too much. Greg Banks, Mike Martin, Renaldo Sagesse, and Adam Patterson are all guys that could play some defensive end. Last year: I ranked Jones #76 and said he'd redshirt. Jones played some cornerback and special teams, making 7 tackles altogether. Last year I thought Jones would redshirt. He came to Michigan after being recruited as a running back or slot receiver, but with the shortage of cornerbacks, he immediately started getting reps on defense. He played cornerback against lesser opponents Eastern Michigan and Delaware State, and he contributed on kickoff coverage, making 7 total tackles. Ideally, he would have redshirted in 2009, but Jones played admirably in a tough situation. Now he's a sophomore and has changed positions once again. Jones moved to bandit in the spring, which is a strong safety-type position. He'll be backing up probable starter Jordan Kovacs and competing with players such as Brandin Hawthorne, Vlad Emilien, and incoming freshman Marvin Robinson for playing time. I don't expect that he'll challenge for a starting position, but he's an adequate backup and could move back to corner if any injuries occur. The best thing Jones has going for him is excellent speed, as he almost chased down Roy Roundtree during the spring game. He's also a pretty tenacious hitter for such a small player. 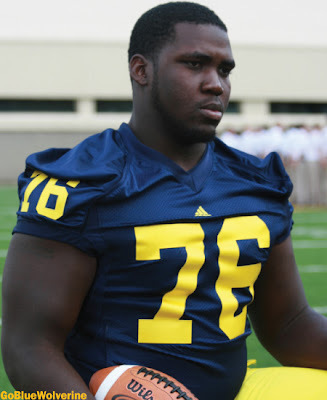 Last year: I ranked Toussaint #74 and said he'd redshirt. He broke his collarbone prior to the season and redshirted. Toussaint entered college as a highly touted running back. I even stated that he would be the best offensive recruit in the 2009 class once all is said and done. Unfortunately for him, the hype fizzled due to an injury (I've read conflicting reports, but it was either his clavicle or his scapula). But with the graduation of Brandon Minor and Carlos Brown, the running back position is wide open and Toussaint got a fair amount of reps in the spring. Reports are that Toussaint would have seen playing time in 2009 if not for the injury, but spring practice reports mentioned that he was a bit hesitant when running the ball. That injury might have had something to do with it, but regardless, he wasn't extremely impressive in the spring game and he seems to be looking up at Mike Shaw, Vincent Smith, and Michael Cox. Physically, Toussaint has the best combination of size, speed, shiftiness, and hands to be the best back on the team. But that doesn't mean he'll be the starter right now. On Sunday evening, Traverse City, MI, offensive tackle prospect Jake Fisher pledged his football services to the Wolverines. Fisher is a 6'7", 260 lb. lineman who has been playing tight end in high school. While he has the skills, hands, and athleticism to play tight end at the FBS level, he's headed for a position change. Scout has him ranked as a 4-star and the #25 offensive tackle in the country. Rivals ranks him as a 3-star. It's unclear how accurate those rankings are, since the recruiting services are trying to project a tight end to a completely different position. However, Fisher's highlight video is a series of pancake blocks with an occasional sprinkling of Fisher running past linebackers and defensive backs to catch a few passes. Hooray for pancakes. I like Fisher. He's a superb athlete for an offensive tackle, moves very well, and for being 6'7", he stays really low. This is not a player whose pad level needs to be questioned. He fits perfectly into Rich Rodriguez's zone blocking system and should be able to latch onto defensive ends and linebackers. As with any high school lineman, he needs to add some weight. A redshirt is virtually guaranteed in 2011, and by then, both Perry Dorrestein and Mark Huyge will have graduated. Redshirt juniors Taylor Lewan and Michael Schofield will be the likely starters at tackle for 2012 and 2013. But that should leave an opening for Fisher to fight for a starting position in 2014 and 2015, likely at left tackle. Welcome to the Wolverines, Jake. Last year: I ranked Patterson #35. He made 1 tackle. That #35 ranking seems just a bit overzealous in retrospect. Who am I kidding? That was probably the biggest miss of the entire countdown. Patterson was a highly recruited kid coming out of school (top 100, I swear! ), but he hasn't been able to translate that potential to college success. 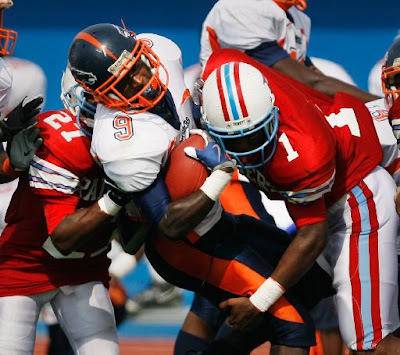 I didn't pay a ton of attention to recruiting when Patterson came out of high school in 2006, but looking back at his high school highlights, those rankings had nothing to do with his football talents - they looked at his speed (4.64 in the forty) and size (6'3", 256 lbs.) and just assumed he'd be a good football player. He had no technique whatsoever. Last year I just had the crazy idea that a top-100 player at a position (defensive end) of zero depth could beat out a walk-on like Will Heininger. Heininger got a lot of run and made 10 tackles and half a sack. Patterson made one tackle. In three years, Patterson has produced 8 tackles, 1 sack, and 1 forced fumble. At least temporarily, Patterson has been bumped to nose tackle, but that might only have been because Mike Martin missed spring practice with an injury. At 272 lbs. and with the aforementioned lack of technique, I doubt Patterson is much of a threat to play at nose tackle, although the coaches did praise his quickness. With Ryan Van Bergen moving to defensive end and Anthony Lalota coming off his redshirt, those two will likely hold down the fort at end. Patterson looks to be a man caught in No Man's Land. Hopefully he can contribute more in 2010 and his versatility is a positive, but he's no better than third string at either position. Last year: I ranked him #59 and said he'd be a backup guard. Barnum played OG against Eastern Michigan and OT against Delaware State. Barnum is one of those guys whose potential remains to be seen. He was highly recruited coming out of high school, but a series of injuries have caused him to miss spring practices and occasional fall practices. His play at offensive center has been somewhat lackluster, which makes him the fourth-string player at the position (behind Molk, Khoury, and Mealer). He's also behind a couple classmates at guard (Omameh and Mealer). But Barnum offers something that nobody else on the team does - the ability to play every position on the offensive line. That makes him an important backup. As Patrick Omameh's understudy at right guard, Barnum should get more playing time than last season; he's probably third string, behind Taylor Lewan and Michael Schofield, at tackle. I don't expect Barnum to vie for a starting job until perhaps 2012, when current starters Perry Dorrestein, Steve Schilling, David Molk, and Mark Huyge will have departed. 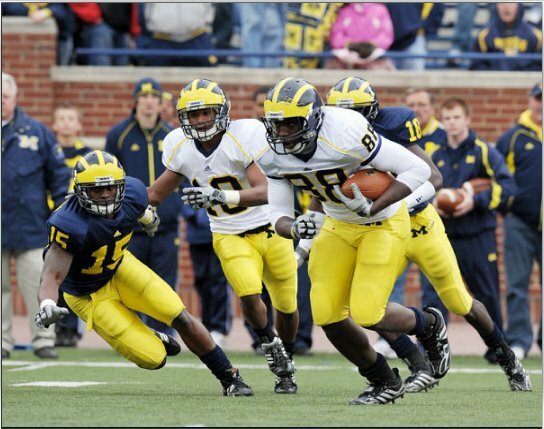 It shouldn't be a surprise that Brandon Graham was Michigan's MVP last year. As I started the 2010 Season Countdown, I assumed (wrongly) that people would remember the series from last year. But after fielding several questions on the topic, I realized that . . . well . . . nobody really read my blog last year. This still isn't an extremely popular destination, but hey, 1,700+ hits for a full-time teacher and coach isn't bad. On to the explanation . . . The countdown is designed to highlight each player and offer some opinions and analysis on each one. They are listed in order of "Least Important" to "Most Important" for the 2010 season. In other words, Christian Pace is at the bottom of the list because he's the most likely to redshirt. Therefore, his impact on Michigan's 2010 performance will be almost nil. Now imagine if Brandon Graham had been lost to injury - Michigan would have lost 10.5 sacks and its defensive leader, and perhaps former walk-on Will Heininger would have drawn into the lineup. More likely, Ryan Van Bergen would have moved to defensive end full-time and Renaldo Sagesse, Greg Banks, or Will Campbell would have played 3-tech defensive tackle. Yeah . . . trading in Brandon Graham for Renaldo Sagesse - albeit a serviceable player - scares me, too. Think about this: if Tate Forcier had been lost to injury and Denard Robinson had made the same number of passing attempts (281), Robinson's 12% interception rate would have translated to approximately thirty-three (33!) interceptions. Michigan fans would have been clamoring for Nick Sheridan. Without Warren (and Boubacar Cissoko, who got booted off the team), imagine potentially having J.T. Floyd and Teric Jones as your starting corners. Yikes! It turns out, Obi Ezeh was injured in 2009, which partly caused him to have his worst season as a starter. 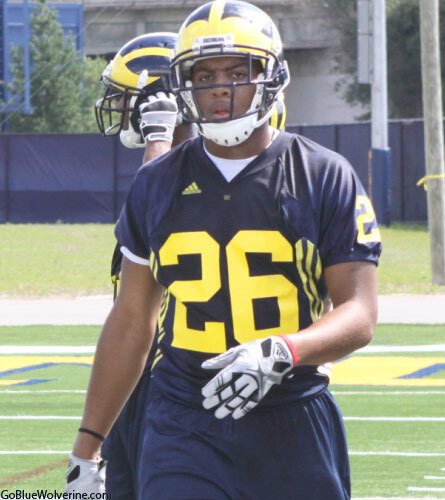 In his stead, Michigan played redshirt sophomore, 206 lb. Kevin Leach. I probably overestimated Brandon Minor's importance to the team, since there were other running backs to pick up the slack. I still maintain that Minor was Michigan's best back for the past two seasons, but the drop-off between Minor and Carlos Brown isn't nearly as significant as, say, Brandon Graham to Will Heininger or from Forcier's 13 interceptions to Robinson's estimated 33 picks. So I'm presenting the 2010 Season Countdown. 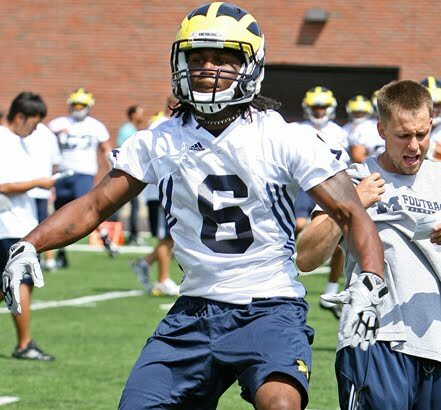 On average, one player will be revealed each day until the beginning of the season, and the #1 guy is - in my estimation - the most important player for Michigan's success this coming season. Last year: I ranked Leach #60 and said he'd be a special teamer. He started 4 games at linebacker, making 46 tackles, 1 sack, and 1 interception. As many people probably did, I underestimated Leach's role on Michigan's defense last year. He had earned some hype as a redshirt freshman and finally got a chance to show off his skills as a redshirt sophomore. Due to some poor linebacker play from the starters - and a then-undisclosed back injury to Obi Ezeh - Leach beat out guys like J.B. Fitzgerald and Kenny Demens for playing time, despite the fact that Leach was about 206 lbs. and a former walk-on. He finished the season with 46 tackles, which is an impressive number for such an undersized kid. By this past spring, Leach's weight had been whittled to 200 lbs. and he was a backup Spur, which is like a strong safety. I question why the coaches didn't try to bulk him up and keep him at weakside linebacker. He doesn't have a frame to carry 240 lbs., but he could have probably added enough meat to get up in the 220 lb. range. Leach doesn't seem to have the speed or athleticism to cover too many guys in open space. He earned his playing time in 2009 by being fundamentally sound, not by being a superior athlete. Regardless of whether he plays Spur, weakside linebacker, or middle linebacker, 2009 was probably the zenith of his football career. He could be a solid backup in 2010, but unless there are significant injuries, I don't think he'll be making 46 tackles again. Gardner will likely redshirt, but largely because there are two good sophomore quarterbacks on the team. He's got the size, speed, arm strength, and leadership - the sky is the limit. Robinson will go through an adjustment period, but he's going to be a star at some point. He should be a 215 lb. heat-seeking missile within a couple years. He's virtually guaranteed to be the starting punter as a true freshman. Furman has run electronic times in the high 4.3-second range. A supposed workout warrior, Wilkins reportedly bench presses 365 lbs. and squats 375 - as a 244 lb. linebacker/defensive end. Even Michigan's middling recruits got a lot of hype, so not many qualify for this category. But Ryan has the potential to be a solid linebacker in a couple years. I'm hoping he plays middle linebacker rather than Craig Roh's rush linebacker position. Jackson's recruiting rankings fell slowly as the recruiting cycle wore on, but he reportedly had offers from Texas and Florida. In my opinion, his lack of speed will make college ball a very difficult transition for him. He enrolled early, but weighed only 259 lbs. for spring ball. 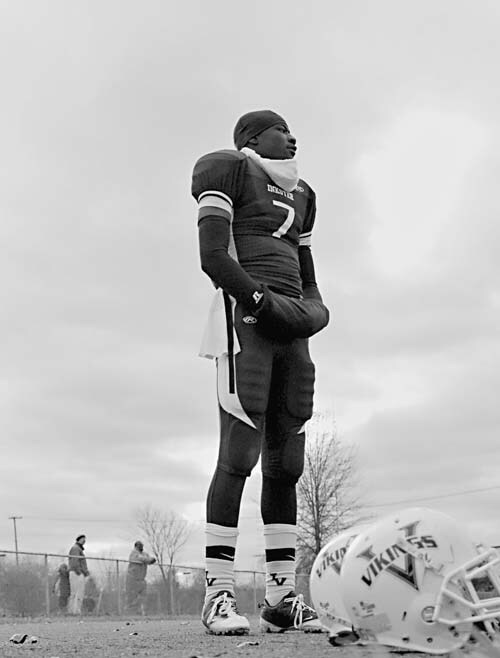 With two capable centers on the roster (David Molk, Rocko Khoury) and a couple other guys who have been getting snaps for two years now (Elliott Mealer, Ricky Barnum), Pace won't be needed in 2010.
a picture of Hopkins in high school. An early enrollee freshman, Hopkins comes in as the heir apparent to Brandon Minor, who was nearly unstoppable in short yardage situations (at least when Minor didn't have a bum ankle). He's a beast of a running back and while he won't run away from too many college players, he will truck through some linebackers and defensive backs at this level. He'll fall forward instead of getting pushed sideways or knocked backward, and that's a good thing when your other backs include guys like Michael Shaw and the tiny Vincent Smith. I expect Hopkins to find playing time this year, although perhaps not as much as some fans expect. He brings the powerback mentality to the team, but that role can also be filled by redshirt sophomore Michael Cox, who happens to have better big-play ability. That being said, Cox has a chance to be the starter in September, which means it wouldn't be a bad idea to bring a fresh Hopkins off the bench. Regardless of who gets the short-yardage carries, there are two backs on the roster who will be able to gain some yards after contact. There aren't many teams who should be able to stop an Iso play from the I-formation with Michigan's offensive line, Mark Moundros leading on a linebacker, and Hopkins ramming it in behind him. Elsa Benitez loves the University of Michigan. I'm sure. Along the top of the page, you'll see that the 2010 Offer Board has been added as its own page. This will make it an easy reference point if you ever want to revisit who Michigan offered in the last recruiting cycle. And when you see some freshman blowing up this season, you can glance back and figure out whether or not to be disappointed that Michigan couldn't reel him in. Secondly, I'm starting to collect data for the 2012 Offer Board. Recruits can't officially be offered until August 1, 2011, but verbal offers are already being given. It will be a very inexact set of data, but it will have to do in the meantime. Anyway, if you'd like, please send me an e-mail or leave a comment on this post if you know of any 2012 kids who have been offered. I already have several names, but I'm sure there are others that I've missed. Thanks! Last year: I ranked Mealer #69 and said he'd see mop-up duty. Mealer played a couple games as a backup left guard and was a consistent contributor on special teams. 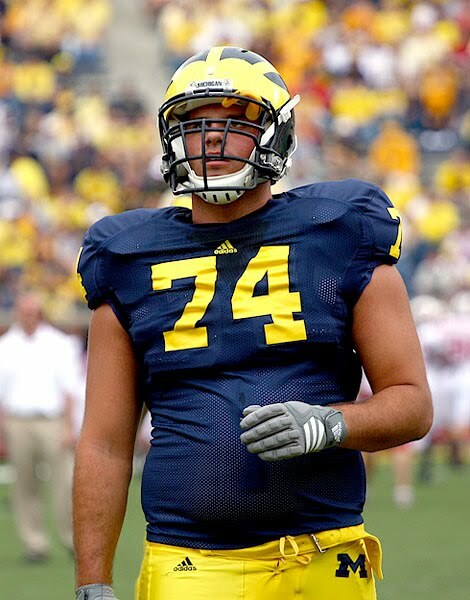 Now Michigan's heaviest offensive lineman, Mealer spent 2009 working his way back into shape after injuring his shoulder in an automobile accident. In the meantime, he beat out more highly touted linemen like Ricky Barnum and Quinton Washington for a role as a second-string offensive guard. In addition, he was an anchor of the field goal protection unit. Mealer's role in 2010 will be reminiscent of his 2009 contributions. 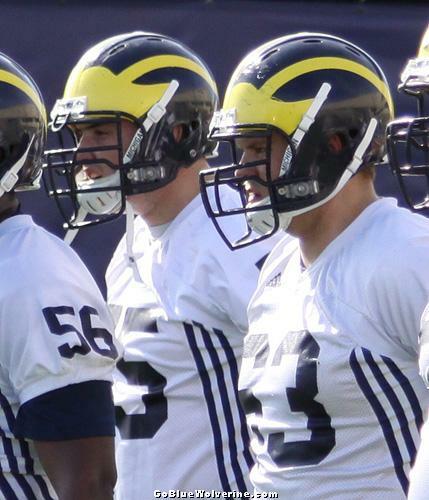 He heads into fall camp as the top backup behind starting left guard Steve Schilling. He's an athletic kid who played some tight end as a high schooler, so he's able to release to the second level and get blocks downfield. And with that 310 lb. frame, he can excel as a blocker on the field goal unit. This won't be his year to shine, but that day isn't far away. Last year: I ranked him #53 and said he'd redshirt. Hawthorne played special teams in four games but didn't accrue any statistics. Hawthorne, a sophomore safety, should have redshirted in 2009. He didn't see any game action after September, having only participated on special teams coverage units in the first four games. Perhaps Hawthorne suffered an undisclosed injury, but it seems odd to burn a kid's redshirt only to run down the field a dozen times. Hawthorne was a practice time backup SAM last year, but has since been converted to safety. When Vladimir Emilien tweaked his knee in the spring, Hawthorne moved from strong safety to free safety and backed up Cameron Gordon playing center field. I doubt that #7 will be playing free safety at any point this season, as I don't think he has the speed to cover a deep portion of the field. He's also a backup at strong safety and seems to be in no danger of winning a starting job this season. But I do expect him to run down the field maybe two dozen times this year. Maybe he'll even make a tackle or two. Last year: I said Ferrara would be a backup offensive guard and wouldn't play much. He started 1 game at offensive guard but was a regular contributor on special teams. Ferrara is one of those character guys whose versatility will be missed. In his first two years on campus, he played defensive tackle. Despite having earned playing time at DT as a redshirt freshman, he volunteered to play offensive guard when numbers on the offensive side started to dwindle. 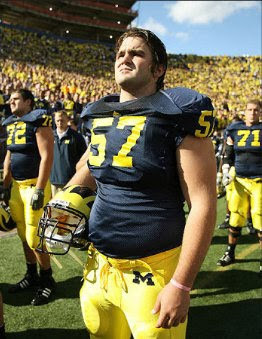 He started five games in 2008, but was relegated to backup duty by Steve Schilling's move from right tackle to left guard. Last season he started against Eastern Michigan, but most of his value was derived from his blocking on special teams. Unfortunately for Ferrara, he'll be standing next to Greg Frey on the sideline again this year. Schilling and Patrick Omameh have locked down the guard positions, and last year the coaches seemed interested in getting playing time for developing youngsters like Elliott Mealer and Ricky Barnum. Ferrara will likely be helping out on special teams again this year and might get a cameo or two if scores get out of hand. But he's a very solid backup in case any injuries occur. Last year: I ranked Schofield #81 and said he'd redshirt. He redshirted. 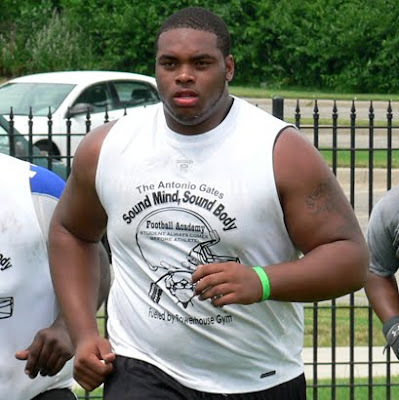 Schofield is a behemoth of an offensive lineman, and reports from his freshman year have been positive. In the spring he was fighting hard for the offensive tackle spot vacated by Mark Ortmann, and his athleticism has been mentioned by several people as something to watch. 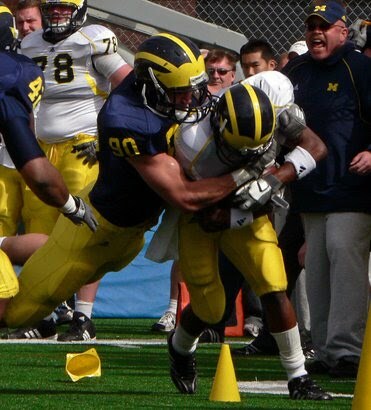 He seems to be fitting into Michigan's zone blocking system very well. Schofield came into Michigan as a likely right tackle prospect, and that's still his apparent destination. Two part-time offensive tackle starters return in Perry Dorrestein and Mark Huyge, although neither one seems a good fit at Ortmann's left tackle position. Dorrestein missed practices in the spring due to back issues, and if those problems persist, expect one of the redshirt freshmen - Taylor Lewan or Schofield - to step into the lineup and protect the blind side. Both were too light last season (Lewan was 281, Schofield was 275) to play, but after a year in the program, they've added significant weight and strength. For the third year in a row, I expect these offensive tackle positions to be a battle throughout the season. Last year: I ranked Jones #49 and said he'd be a backup SAM. He played special teams in 7 games and made 3 tackles. Jones was an early enrollee in 2009 who I expected to contribute in a more meaningful way due to the shortage of scholarship players. Instead, he was exclusively a special teamer. For some odd reason, the coaching staff burned his redshirt so he could play about half a season on coverage units and make 3 tackles. That seems like a waste of a year of eligibility, but obviously I'm just a guy on the internet. Anyway, Jones made a transtion mid-season from SAM to the weakside linebacker position, at least nominally backing up Jonas Mouton. He'll enter fall camp anywhere between the third- and fifth-string weakside backer. Mouton will start, but J.B. Fitzgerald, Kevin Leach, and perhaps Kenny Demens will figure into the depth chart. Jones is also pretty light at only 207 lbs., so he'll probably need to spend another year or two adding weight. Last year: I ranked him #56 (weird!) and said he'd be a backup WR and special teams contributor. He was a backup WR and made 7 special teams tackles but switched to cornerback halfway through the season. I said this last year, but so far it seems that Rogers has been screwed over at Michigan. I really feel bad for this kid. His first year was wasted by playing cornerback in garbage time, preventing him from redshirting. Then he switched to wide receiver when Rich Rodriguez was hired, started two games, and made 3 catches for 64 yards. Then he switched back to cornerback in mid-2009. 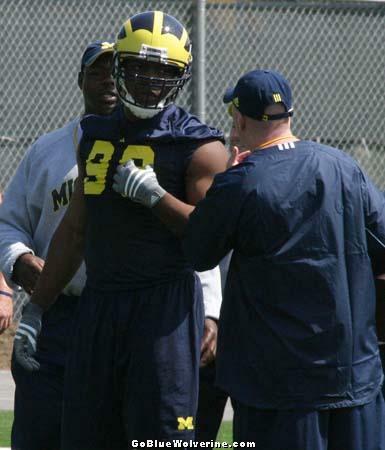 For some reason, Rogers' development has been put on the backburner throughout his 3+ years at Michigan. Rather than keeping him at one position where he might improve, he's seemingly been jerked around despite performing decently at both positions. 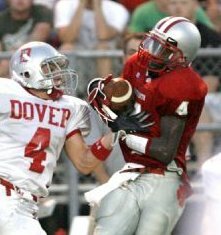 He'll likely be a backup cornerback and a special teamer in 2010, his senior year. It would be nice to see him make some strides and earn some playing time this year, but I'm not counting on it. If that doesn't happen, I hope he can at least earn some run as a gunner on the punt unit and maybe fall on a muffed punt or two. Kudos to James Rogers for playing wherever the team has needed him. Prediction for 2010: Backup cornerback and special teams coverage. Probably another position switch or two as well. Last year: I rated Robinson #30 and figured he would get an opportunity as a punt returner or kick returner. He finished the season with 1 catch for 13 yards and 1 punt return for 11 yards. Robinson is a tantalizing athlete out of Texas, someone whose skill has outpaced his production so far. 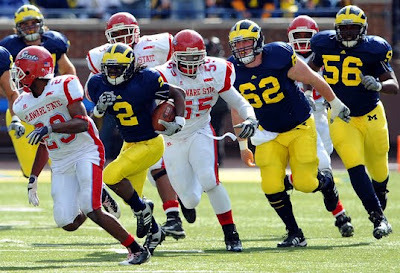 He suffered a knee injury in 2008, which forced him to redshirt. Then he reportedly had problems catching the ball in 2009, which prevented him from contributing as much as many (including me) expected. But he was a high school quarterback and running back, so I should have expected the adjustment to take a little bit longer. But reports from this spring indicate that his hands have been better, so Terrence could contribute a little bit more at receiver or returner. His talent probably deserves a ranking above #57, but the depth at slot receiver means that a good season from him isn't necessary for the team to succeed. Any positive contributions from Terrence will hopefully be icing on the cake, because these slot receivers are going to be dynamite in 2010. One of several early enrollees on offense, Robinson is perhaps the most likely to earn playing time this fall. He earned solid reviews throughout the spring for his ability to run routes and make plays downfield, and he's the most athletic of the freshman wideouts. With only a few returning wide receivers, at least one freshman will play. Despite not enrolling early last year, freshman Je'Ron Stokes played sparingly, beginning with the first game of the year. Including Stokes, the Wolverines played five scholarship wide receivers last year - Greg Mathews and Laterryal Savoy, both of whom graduated; and Junior Hemingway, Darryl Stonum, and Stokes. If that number were to stay the same in 2010, two freshman would have to play. However, that need for freshman contributions may be mitigated by the fact that Roy Roundtree and Martavious Odoms may have the option and versatility to play outside, rather than just the slot. All things considered, expect to see Robinson on the field in the fall. Last Year: I ranked Gallon #52 and suggested he'd help out on returns. He redshirted. Gallon, a high school single-wing quarterback, came to Michigan with a lot of hype but was reportedly out of shape as a freshman. He's an excellent athlete and a strong, slippery runner. But he's also somewhat new to the job of running routes and catching the ball, having been almost exclusively a ballcarrier in high school. Gallon is now a member of perhaps the strongest, deepest position on the team - slot receiver. Starters Martavious Odoms and Roy Roundtree return, and Kelvin Grady contributed 10 receptions; Terrence Robinson will also be vying for playing time after playing sparingly as a redshirt freshman. With all of that depth, one backup is almost indistinguishable from another. While I think Gallon will be a very good player before all is said and done, he doesn't figure to earn a ton of playing time in 2010. Once again, his best opportunity to see the field will be returning kicks and punts. But it remains to be seen how big of a need that will be, since Darryl Stonum set a record for kick return yardage in 2009. Gallon will likely play some role in returning punts and kickoffs, but that contribution may be minimal. Ron Tanner (FS) committed to Ohio State. Chevelle Buie (SR) committed to Rutgers. Nick Vannett (TE) committed to Ohio State. Ray Hamilton (TE) committed to Iowa. Kevin Sousa (QB) and Jack Miller (OC) committed to Michigan. Ja'juan Story (WR) committed to Florida. Ryan Shazier (LB) committed to Florida. Andre Yruretagoyena (OT) committed to Oregon. Brandon Phelps (CB) committed to Virginia. 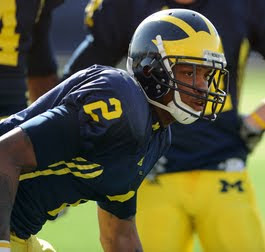 Early in the recruiting process, Michigan fans were hyped up about Ricardo Miller. Originally from Orlando, he and his family decided to move to Michigan so he could enroll early at Michigan. So he played ball this past season at Pioneer High School, in the shadow of Michigan Stadium. 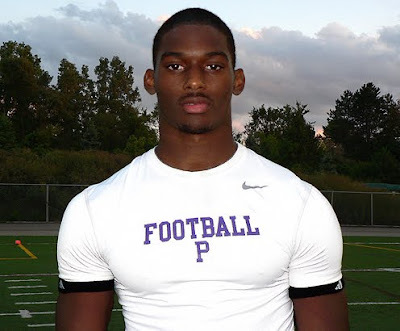 Not only was Miller seemingly a highly rated wide receiver, but he was clearly 100% committed to the Wolverines and exercised that enthusiasm by pushing hard for other kids to commit. So as much as I like the kid's character, it pains me to say this - but I don't see the vast amount of potential that many other Michigan fans do. Some have already been clamoring for him to be given the #1 jersey, which is reserved only for the most special receivers at U of M. Miller doesn't seem to have great speed or leaping ability, and he had some problems with dropping passes at Pioneer. In my opinion, the best thing Miller has to offer at this point is his size and blocking ability - at 6'4" and 212 lbs., he should be able to dominate opposing cornerbacks in the running game. That might be enough to get him on the field in the fall, especially because outside wide receivers are in short supply on this team. Last year: I ranked him #80 and said he'd redshirt. He redshirted. Washington is a mammoth offensive guard, weighing more than all but two of his teammates - nose tackle Will Campbell (324 lbs.) and fellow guard Elliott Mealer (310). As evidence that Rich Rodriguez is embracing larger offensive linemen, there are now five 300-pounders; there were only two in 2009. With several guards ahead of him on the depth chart last season, Washington's services weren't needed . . .
. . . and they probably won't be needed again this year. David Moosman was the only guard to graduate in 2009. Steve Schilling returns at left guard, and last year's part-time starters at right guard (Patrick Omameh and Mark Huyge) also return. Mealer, Ricky Barnum, and part-time 2008 starter John Ferrara also return. There have also been reports from practice that Washington has been developing slowly. That's not a concern at this point, considering that he's only one year removed from high school. But Michigan fans shouldn't be expecting to see Washington on the field much this season. Perhaps he can push for the guard position that Schilling will be vacating after this season. The brother of former Michigan running back Kevin Grady, the younger Grady came to Michigan to play basketball. But he didn't quite fit in Coach Beilein's system and left the basketball team. Grady then decided to walk on to the football program in 2009 after having been a star high school running back. Grady was impressive enough that he earned starter-level playing time early in the season. He caught 10 passes for 102 yards and 1 touchdown, but was surpassed late in the season by Roy Roundtree; Grady started dropping passes and then didn't even play in the final three games of the year. The word from insiders is that Grady will be given a shot to earn playing time at either slot receiver or running back in the fall. Without a returning starter at the running back position - and underwhelming performances during the spring game - Grady might offer some depth. I'm not expecting much from him this fall. He's too slight to play running back in the Big Ten, and there are better options there; and the combination of Roundtree and Martavious Odoms at slot receiver is potentially deadly, not to mention up-and-comers Terrence Robinson and Jeremy Gallon. It's a good thing for Michigan that someone with Grady's talent might be its fifth best player at the position; it's a bad thing for Grady himself. Prediction for 2010: Scarce duty as backup slot receiver. He won't match the stat totals from 2009. Last year: I ranked Watson #64 and said he'd contribute on special teams and see spot duty on defense. He was mainly a special teams player and made 5 tackles. 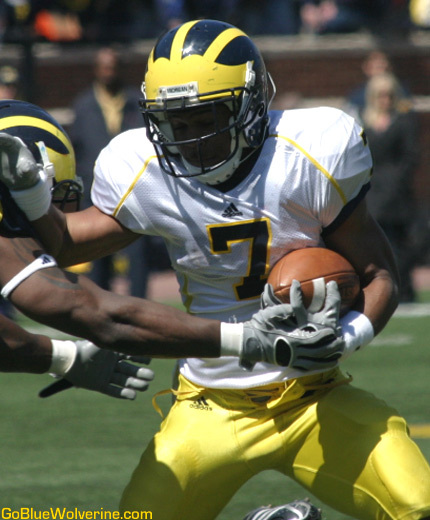 Having been buried on the depth chart behind Kevin Koger, Martell Webb, and Brandon Moore, Watson switched to defense during the spring of 2009. 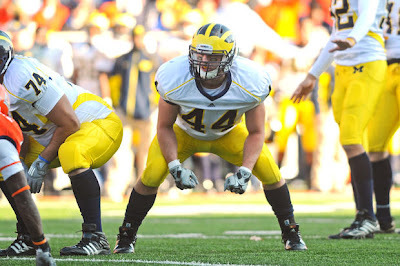 Greg Robinson was a new defensive coordinator then and needed a few players to play the defensive end/outside linebacker hybrid role that was eventually locked down by freshman Craig Roh. Brandon Herron was Roh's primary backup, and Watson settled for mop-up duty against teams like Delaware State and Illinois. He finished the season with 5 total tackles, 1 tackle for loss, and 1 pass breakup as the third-string OLB. He was also a part-time contributor on special teams, but only against the B-list teams on Michigan's roster. For spring of 2010, Watson switched roles again to 5-tech defensive end. Assuming no further position changes, he'll be playing exclusively with his hand on the ground. Despite the position change, Watson will probably still be no higher than third on the depth chart. The starter will likely be Ryan Van Bergen with Anthony Lalota as the primary backup. A freshman like Jibreel Black could also work himself into the mix. 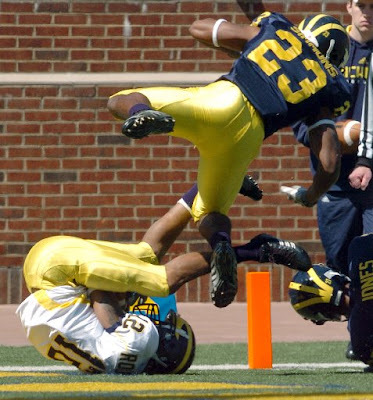 Buried on the depth chart at yet another position, I expect 2010 to be Watson's final campaign as a Wolverine. He probably won't be offered a fifth year of eligibility by the coaching staff. Robinson was a highly touted recruited all through high school, earning raves and hype from Michigan fans at least as far back as his sophomore year. As you can see above, he's well put together. Despite the fact that Rivals changed his position from safety to outside linebacker in its ratings, all indications from Robinson himself have pointed toward him playing strong safety in college. He's a big safety and will likely be 200+ lbs. by the time the season rolls around. He doesn't have the speed and quickness to play deep safety at the Big Ten level, in my opinion, but he is a very good athlete and a hard hitter. I expect Robinson to earn more and more playing time as the season goes along. He tried to enroll early, but there was a snafu with his graduation/enrollment and that didn't happen. That will slow his development somewhat. But with the lack of experience in the defensive backfield, I wouldn't be surprised to see Robinson beat out some of the less heralded recruits or former walk-ons who currently litter the depth chart. He'll still only be a freshman, though, so a starting role is probably at least a year away. Last year: I ranked him #75 and said he would redshirt. Bell redshirted. Bell is in his second year of the program and making an adjustment from playing high school safety to playing college inside linebacker. Up to this point, he hasn't really made his mark on the team. Obi Ezeh and Jonas Mouton are the presumed starters at the inside linebacker positions, and J.B. Fitzgerald, Kenny Demens, and Mike Jones are scheduled to be the first ones off the bench. I'm a little surprised that Bell was bumped to inside linebacker rather than Steve Brown's hybrid role, but at 237 lbs., Bell has put on enough weight that the hybrid position would no longer be an option. In the pictures I have seen, Bell still looks a little bit soft, so I think he's still got some work to do with his conditioning and nutrition habits. But I stand by my assessment from last year that Bell will be a good player in college - it just won't be this year. Bell could be a contributor on special teams this year, and we might also see him at linebacker against teams like UMass or Bowling Green. Otherwise, I don't expect to see #26 on the field much this year. Last year: I ranked him #62 and said he'd see some special teams action. Moore caught 1 pass for 19 yards. Moore was a pretty big deal coming out of high school. He was a big, very athletic tight end. 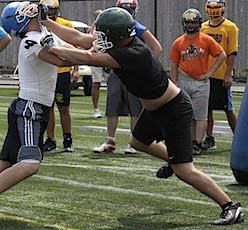 He mostly split out wide as a high schooler, so in-line blocking has been an adjustment for him. But he's packed on 17 lbs. since last year and might have improved in that area. At 260 lbs., he's currently the biggest tight end on the roster. I'm not sure if that's a good thing or not. Despite Moore's newfound weight and excellent athleticism, I still expect him to be the third tight end on a team that doesn't use the tight end very much. Both Kevin Koger and Martell Webb have played ahead of Moore for the past two seasons, and I don't know why that would change now. He's actually ranked lower this year, but that's largely because last year's team only had about 70 scholarship players (as opposed to the 80+ on the roster this year) and there are a handful of freshmen in line for playing time on defense. As a high schooler, Johnson led his team to a second place finish in the state playoffs. He played free safety and wide receiver, although he was mainly a decoy on offense. Johnson is a prototypical strong safety in my mind, although Cameron Gordon seems like a strong safety to me, too, so what do I know? For now I'll stick with that assessment, although it looks like Greg Robinson is tweaking this defense in ways we can't fully grasp yet. We went from having a former cornerback and Big Ten sprinter (Troy Woolfolk) playing center field to a slow-ish wide receiver who many projected as a college linebacker (Cameron Gordon) playing free safety. I think there's a fair chance that we'll see Carvin Johnson playing defense this year. The depth in the defensive backfield is thin, and walk-ons litter the depth chart (Floyd Simmons, Jared Van Slyke, Jordan Kovacs). I don't expect Johnson to earn a starting job this year, and he'll most likely redshirt. But I don't think Rich Rodriguez can afford to throw too many former walk-ons out there this fall and expect to win a bunch of games. Either Johnson or Marvin Robinson will play this fall, and I give Robinson the edge due to superior athleticism.